So I finally got around to assembling the parts. Spike's AR-15 Punisher version lower receiver. Magpul MOE Rifle stock, MOE Plus pistol grip (with Goliath Kydex overwrap for CA compliance), Magpul trigger guard. Muzzle thread protector probably temporary with a jam nut off the tanker brake that will replace it after testing. Alexander Arms magazines. Couple 7 round, 1 ten and 1 four if I ever decide to use it for hunting. I need to relieve the handguard a bit at the bolt that holds the adjustment leaf spring in place. I didn't use the gap filling compound because I knew that was a possibility as well as I wasn't sure about the gas block adjustments. I left off the tanker brake for the same reason. I may or may not decide to go to a pepper pot brake to save weight. The pepper pot may also work better when using the offset sights. Good thing I picked up the extended hex driver to adjust the gas block as it's about 4-5" inside the handguard. Positive stops on the adjustable block and easy adjustment. The build feels pretty light so far. Once I add an optic I suspect it'll feel like it bulked up. I'd like a 1-6x24 with a 30mm tube but I may settle for 1-4X. Luepold is pretty proud of their tubes and reviews on the middle of the road ones are mixed but I may try one anyway. I'll try and post some pics when I get a chance. I also need to add some BCM grip-covers for the keymod rail at some point. I've decided to give Atibal a shot and try one of their 1-6x24mm 30mm tube FFP scopes. Rainier was running a special: buy the scope and get a QD mount thrown in. 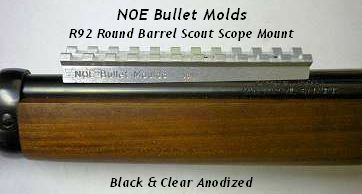 I am going to try the scope on a Aeroprecision canter leaver mount that I've got that isn't a QD setup on the Beowulf. IF I can make it work. I'm a little less than pleased with the construction of the Aero mount. The integral mount forms half of each ring split vertically with a sort of half hook on the top of each half ring so that the only fasteners are at the bottom of the rings. That makes it more difficult to get the scope level since it sort of wants to rotate a tiny amount as you tighten the screws at the bottom of the ring. I've had the mount lying around since I built my .308 AR-10. I had intended on using it with that build but decided to go traditional with Warne ultra high steel QD rings. I'm going to repurpose the Atibal QD mount to my Odin Works 6.5 Grendel build with a Leupold 4-12x40 Patrol. I got one of those a month or so back also on sale. Interestingly that scope would have shipped second day free except it was listed as 'cannot be shipped other than by ground' probably because it included the coin battery. Thank you Samsung! IF the Aero mount doesn't work out I'll probably wind up donating it to a buddy of mine and replace it with either a set of Warne QD rings or a American Defense QD unified mount. I really like the Warne rings but they are a bit heavy. Another option would be A.R.M.S. throw lever rings. I also picked up a Strike Industries ejection port door. It's the plastic door that has the spring pre assembled to it with a hinge that's spring loaded on one side so that it's super easy to install or remove from an assembled gun. The spring loaded detent pin that holds the door closed is 'adjustable for wear'. With a narrow blade screwdriver you press down the detent and screw a retaining collar out or in to allow the detent to extend the required amount. It works with the big bore upper receiver as a 'door' but I suspect as a dust cover it's nearly useless since the door is not a tight seal to the enlarged port. Got the gas block tuned and the scope is partially dialed in. This is going to be a fun thumper, I'm not certain it's the equivalent of a .45-70 although it might be with normal low pressure .45-70 factory ammo. The gun feels light and manageable. The 18" barrel is not too long and the tanker brake while visually a bit much doesn't seem to be too heavy or loud or any of the other annoying possibilities I was concerned about when I put it on so I don't think I'll be putting a pepper pot on it any time soon. I think I would rather have a .45-70 AUTO in terms of ballistics but a AR-10 based platform is a lot heavier than the AR-15 based big bores. So far I'm liking it. Back to the range for session II. Checked the gasblock before going out and it's full open so a standard gas block would have been fine and saved me some money. I may change it out as some point or I might just leave it. I ran 16 rounds the first outing but mostly single shot adjusting the gas block. This time out I don't know how many rounds went through it. I used another 8 rounds of ball. My boss brought out some of the exotic rounds including 350 grain Hornady XTP Mags, Lehigh Defense solid copper X nose bullets, 200 grain frangible and I don't know what else. The gun was accurate, light and felt good but function especially with full mags and some of the exotics was not what I'd like. My boss mentioned he had the same problem with his Alexander upper until he got about a 100 rounds through it. I may dry cycle the gun a bit. I need to get some more rounds through it as well but I'd like to cut the costs down from the $1.50/shot factory so I guess I'd better get my reloading going. I've got 500 or more 320 grain plated slugs that should start getting put to use. If the feeding wears in on this one it is going to be excellent. I would lube it up a lot and dry cycle it a lot until your sore or tired of it see if it fixes the reliability issue. Hopefully you can save some ammo and get it broken in.